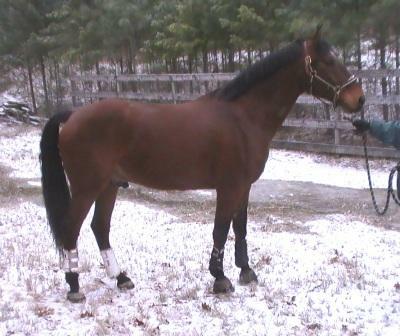 He is a Holsteiner/Saddlebred cross gelding, trained through first level. Big, bold and fancy. He was the AWS National Silver Medalist in 1996, right behind Nigel's sister Prima. He qualified for Championships at Training level several years ago. He is technically Nigel's genetic full brother, by Flight Time Gold out of Faara's (See pics of Faara on her page!) sister Dionysia (Flitzen). "Lock has exceeded my hopes and expectations in almost every way, but he has struggled with soundness since about the age of three years. I did show him at Training and First Levels with pretty good success. We competed at the State Championships (training level) when he was four, and we would have been in the top 3 had a bystander not opened an umbrella in his face! I actually thought he "weathered" it quite well, but the judge apparently didn't see ithe incident, and marked us down for the next couple of movements due to "tension". Oh well, that's the horse business as we all know. Anyway, by the age of 5, I semi-retired Lock as no one could seem to figure out what was causing his intermittant lameness. I pursued every diagnostic available at that time other than nuclear scintigraphy and MRI (the insurance wouldn't cover any more, and I couldn't afford to pay for it out of pocket as Joe and I were in the midst of divorcing). He went to live with my sister in California, and had light use as a trail horse. I visited him occasionally, and sometimes he was sound and sometimes he wasn't. He lived there for about 5 years, then I took him back in January of 2007. His issue had always manifested as a bilateral soreness in the front feet. However, when he came home from California, he was quite lame on the left front - it was winter in the Mount Shasta area (read heavy snow and ice) so my sister was not sure of the duration. By this time, available diagnostics had improved ALOT, and we did ultrasound and digital rads as well as standard blocks and flexion tests. The working diagnosis was a torn deep digital flexor tendon in the foot. It seemed likely that this was a recent problem, and not a part of the prior issue, so we pursued a course of shock wave therapy, with stall rest initially, and then corrective shoeing (Natural Balance) and close to a year at a rehab center for daily swimming. 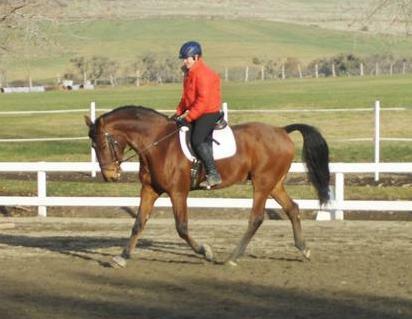 Lock responded well, and we started him back under saddle in February of 2008. By June2008, he started to struggle again - and this time it did seem to be both front feet (if you blocked one side he would be lame on the unblocked side). However, when we repeated radiographs, we found that the farrier appeared to be the culprit, as Lock's coffin bones were at about a 16 degree angle. Yikes! Needless to say, we changed farriers, and then had to change vets also, as we were in the midst of moving to Southern Oregon. It has been a slow process getting him straightened (literally) back out, but he has been doing well, and has been rideable again, for ~ the last 9 months. I have been very pleased with our vet here - we repeated x-rays, blocks, flexions, etc..., and his feeliing is that what has troubled Lock for all these years is probably sidebones. Sidebones are usually NOT a cause of lameness, so everyone else had discounted them as a potential source of the problem. However, I knew that he had developed them when he was quite young and sure enough, when I got the rads that Barb Crabbe had taken of him as a three year old - there they were. They seem not to have progressed over the years, but they are quite large, so it does seem likely that they have been the culprit. He is now in bar shoes and pads and I have played with a variety of supplements to find what is most helpful (as an aside, I highly recommend the "Theracell" product line). He needs to be warmed up thoroughly before going to work, and he can be mildly "off" when he first comes out. Ever since the step up to a one size larger shoe (about 8 weeks ago) the right front has been bothering him - I am hopiing he will adjust to the larger shoe, as the vet encourages it as added support. Anyway, this would all be very encouraging and promising, except that the terrible economy has finally caught up to us. I just can not afford to keep him any more, and it breaks my heart. I would be willing to give him to a good and loving home, and I am hoping you may have a student or friend who would consider him. I took a couple of short video clips of him last week, so you can get a feel for where he is at ( it was kind of a remedial ride as he had had 2 weeks off due to a virus that went through the barn). He is quite uphill, and, like Wonder, he has a fabulous canter. He is VERY smart, and a real character. He did, however, get enough of his mother's temperment to make him a bit of a challenge. He is not for a beginner rider or handler, as he will definately try to be the boss. I would be happy to send further pics/clips of him if you are intrigued and want to see more."